Washington Monthly | Education Technology Hasn’t Worked Yet. Why’s It Going to Work Now? Education Technology Hasn’t Worked Yet. Why’s It Going to Work Now? It’s tempting to think technology can fix most of education’s problems. There have, in history, been lots of problems that seemed intractable and in need of vast complicated policy initiatives to address them. And then, in an instant, technology makes them disappear. During the 19th century, for instance, the streets of America were covered in horse excrement. Public health reformers puzzled for years about how to fix this problem, how to get the horse poop out so children could play and people could work with relative ease. Pundits worried that by 1930s the horse droppings would pile up to the third floors of city buildings. Then we got the automobile and no one worried about that again. Education is not a design problem with a technical solution. It’s a social and political project neoliberals want to innovate away. For… corporate education reformers, knowledge is static and students are passive recipients; efficient transmission of information is the goal of education. And technology is the means by which we make the transmission process faster, cheaper, smarter. Gifted children are best served by moving individually at their own pace, “slow students” move at theirs, all in isolation. The problem with this is that with education the barrier to higher achievement might be more structural. In the mid-20th century we tried radio college, in which people we supposed to receive higher education remotely, by listening to lectures on the radio. In the 1950s psychologist Sidney Pressey developed a teaching machine in which children sat at long tables and worked alone, completing individual tasks to learn lessons. In 1962, when The Jetsons premiered, the family’s young son, Elroy, learns his lessons from a robot named Ms. Brainmocker. None of this stuff works. Or, the methods proposed are so unnatural, and so unpleasant to actual human beings, that they don’t work to address the serious achievement gap we have in American schools. But Erickson noticed something interesting here. Many of the people who are so very eager to push technology-based education reform seem curiously to get that these methods don’t work for actual human beings. How do we know this? Waldorf schools incorporate creative and tactile experiences and tools including hammers and nails, knives, knitting needles, and mud — but not computers — into the curriculum. Engagement comes from the connection between children and their teachers, who stress critical thinking and aim to create interesting, inquiry-based lesson plans. According to the Times, employees at Google, Apple, Yahoo, Hewlett-Packard and eBay send their children to the Waldorf School of the Peninsula. “The idea that an app on an iPad can better teach my kids to read or do arithmetic, that’s ridiculous,” Alan Eagle, a Google communications executive who’s written speeches for Eric Schmidt, told the Times. This sort of thing is not a personal quirk, like a preference for Fresca or loose-fitting suits. Nor is it like the Obamas sending their children to Sidwell Friends while worrying about the state of American public schools. No, Waldorf schools use an education philosophy directly in contrast to the education reform strategies pushed by those selling education technology. The very Silicon Valley reformers promoting and funding techno-utopian models for American schoolchildren refuse to submit their own children to anything like it, choosing innovative pedagogical models instead of newer touch screens. 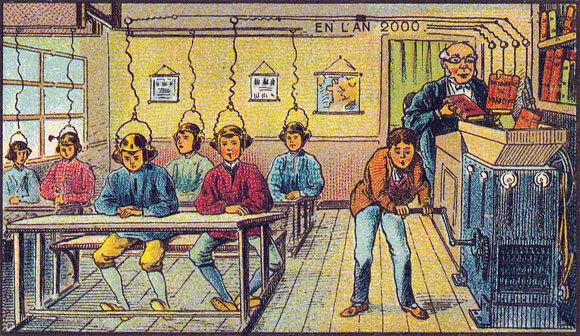 But the techno-utopian model offers a continual promise of an education solution just waiting around to be developed at a company somewhere, even though this magical teaching machine never really materializes. Technology sales pitches can seduce us all when we’re looking to buy stuff or address technical problems at work. But somehow we’re never really interested in taking that sort of gamble when we’re raising our own children. Why is it OK to do this when we’re talking about someone else’s?